This U.S. flag is 100% Made in USA with Sewn Stripes, Embroidered Stars and Brass Grommets. Expertly sewn using Annin’s heavyweight 200 denier nylon fabric. Annin Flagmakers dyes its own ColorFast Nyl-Glo U.S. Flags and guarantees the colors for one full year. Sewn stripes and embroidered stars, this flag is suitable for Parades or Indoor Display. All Nylon and available trimmed with two inch gold rayon fringe or without. The flannel lined hem slides over standard 1 ¼ in. poles and has a tab sewn inside for attaching to pole. Indoor flag sets include Oak Flagpole, 7″ styrene eagle ornament, golden yellow cord & tassel set & liberty style floor stand. A lustrous light weight material with brilliant colors . Ideal for your classroom, office or other indoor applications. Available with or without gold fringe. It is important to select the correct material and size American flag for your particular use. We’ve prepared the guidelines below to help make your choice an easy one. Made from 100% SolarMax nylon, Annin’s Nyl-Glo is by far the most popular choice for commercial or home use. 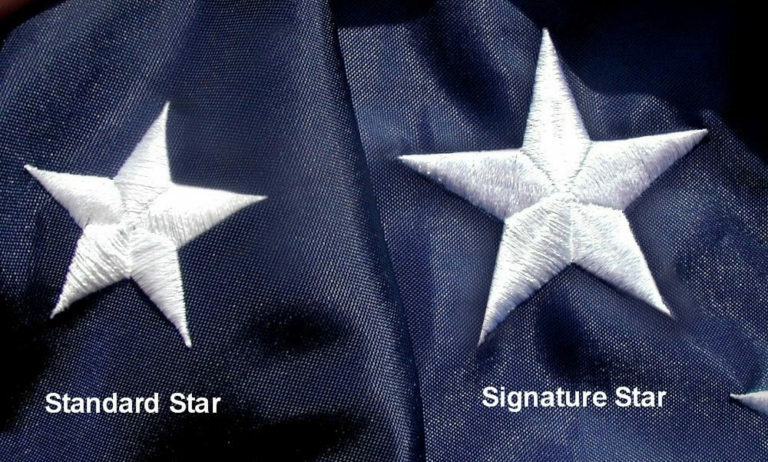 It features sewn stripes and embroidered stars. A good all-weather flag, it flies in the lightest breeze. Available in sizes 12 X 18 in. 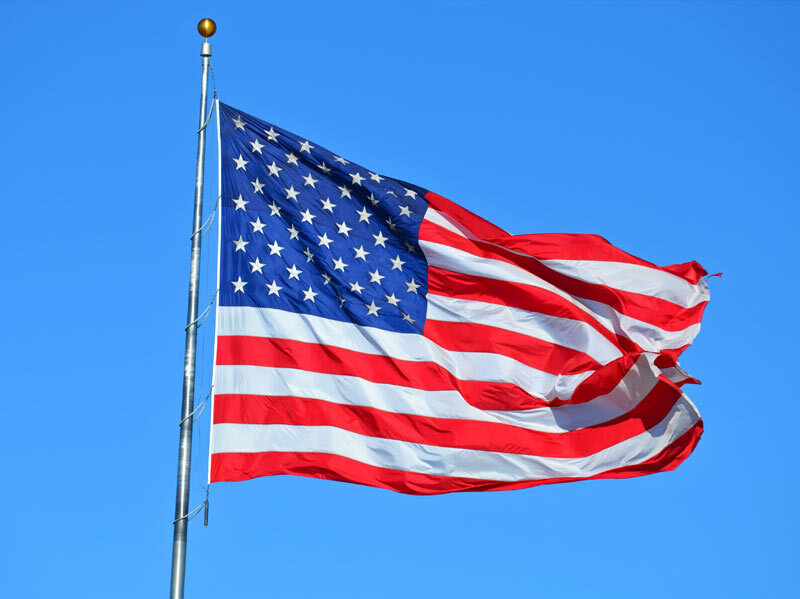 through 30 X 60 ft, Nyl-Glo U.S. flags carry a One-Year Colorfast Guarantee. Made from 100% heavyweight spun polyester. This flag is extremely durable and is best for high-wind areas and large sized flags flown daily. Tough-Tex is ideal for commercial or institutional use. 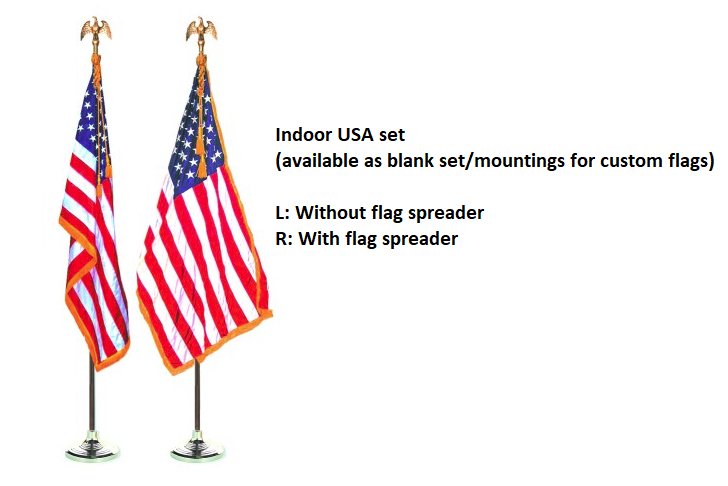 Available in sizes 3 x 5 ft. through 30 x 60 ft., Tough-Tex U.S. flags carry a One-Year Colorfast Guarantee. Made from 100% SolarMax nylon, Annin’s Signature flag has all the same features as our Nyl-Glo flag but sets itself apart by the extra-large, ultra- bright embroidered stars and the attractive presentation packaging. Available in sizes 2½ x4 ft., 3 x 5 ft. and 4 x 6 ft. Signature flags make a great gift and carry a One-Year Colorfast Guarantee.